Posted: May 6, 2016 10:41 p.m. Updated: May 6, 2016 10:41 p.m.
Valencia's Kiki Shakir (12) shoots on net while defended by Glendale's Madeline Aguilar Friday in the U.S. Lacrosse Southern Section Los Angeles Division 2 semifinals at Valencia High. 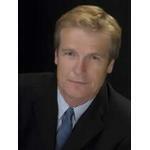 Photo by Tom Cruze for The Signal. 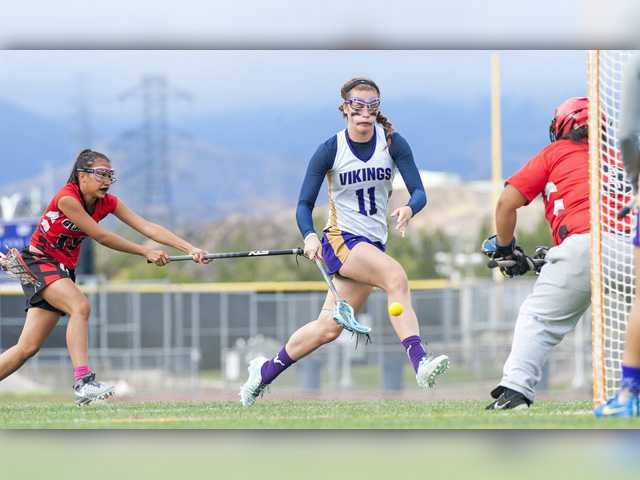 Valencia’s Kayla Konrad, center, carries the ball to the net while defended by a host of Glendale defenders in the U.S. Lacrosse Southern Section Los Angeles Division 2 semifinals at Valencia on Friday. Photo by Tom Cruze for The Signal. 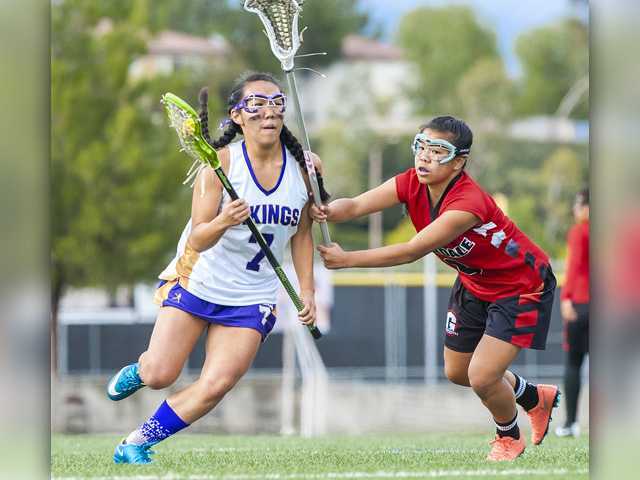 Valencia’s Mandy Yamamoto, left, puts the Vikings ahead 5-4 with her goal in the second half of their the U.S. Lacrosse Southern Section Los Angeles Division 2 semifinals at Valencia on Friday against Glendale High School. Valencia lost 9-6. Photo by Tom Cruze for The Signal. Valencia's Kayla Konrad (11) rushes the net as Glendale's Xcaret Salvador (left) defends and goalie Jenina Villabroza waits for the shot in the second half of their U.S. Lacrosse Southern Section Los Angeles Division 2 semifinal at Valencia on Friday. Photo by Tom Cruze for The Signal. 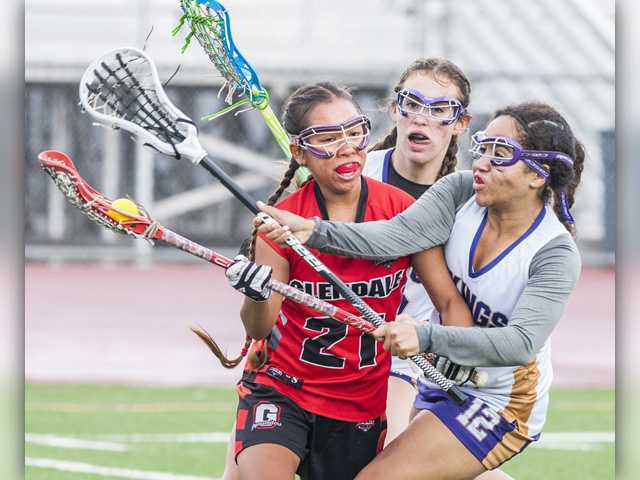 Glendale High's Angel Ancheta (21) is defended by Valencia's Kiki Shakir (12) and Valencia's Jenny Elliot in the first half of their U.S. Lacrosse Southern Section Los Angeles Division 2 semifinal at Valencia on Friday. Photo by Tom Cruze for The Signal. 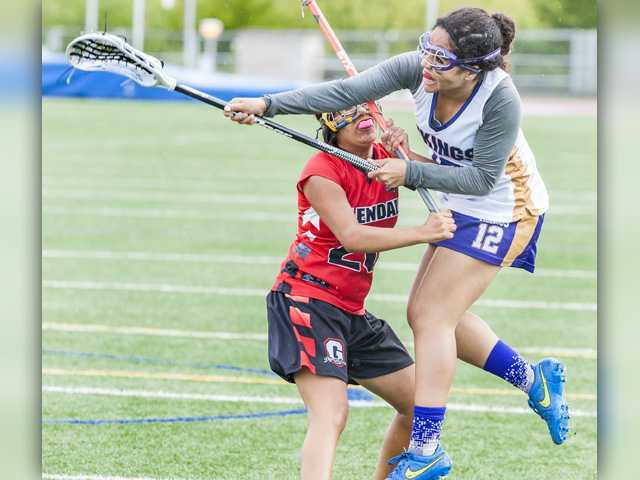 It wasn’t quite the storybook ending the Valencia girls lacrosse team was looking for. 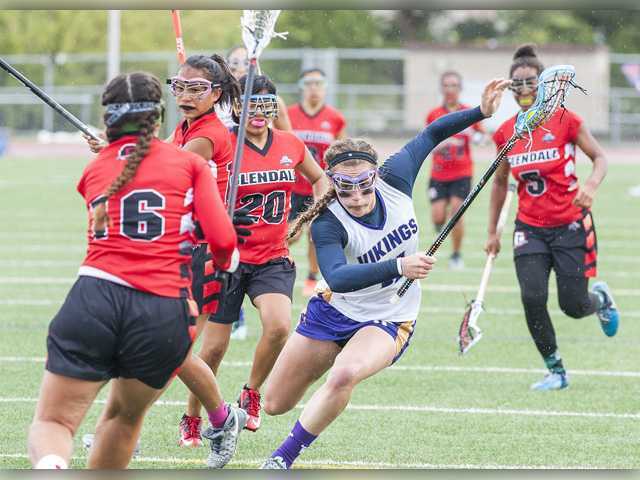 The Vikings’ inaugural season came to an end with a 9-6 loss against visiting Glendale High Friday night in the U.S. Lacrosse Southern Section Los Angeles Division 2 semifinals. But their season was definitely the beginning of a new chapter. The playoffs were in the discussion for the Vikings, though, after winning their final five regular season games of the season. Valencia made it six in a row Wednesday with their first-ever playoff win, defeating Westridge of Pasadena, 19-10. The Vikes got out to an early start Friday when Kayla Konrad sent a floater just passed Glendale goalie Jenina Villabroza in the third minute of the game. Konrad used that same soft touch with just under 20 minutes left in the first half to score again. She recorded five goals on the night. But the Nitros stormed back with three straight goals in the span of five minutes to take a 3-2 lead with 4:22 left in the first half. Valencia’s Katie Von Mecklenburg went on a nice run that set up Konrad’s third goal of the game to tie the score up at three with 2:43 left in the half. After the break, Valencia’s defense was strong, but so was Villabroza. The Nitros’ senior goalie, and three-time Pacific League first-teamer, had 15 saves in the net and halted the Vikes’ offense in the second half. The Vikings found a way to regain the lead in the second half (5-4) when Mandy Yamamoto had a stunning move (right, left, then right again) with 14:23 left in the game. But Glendale scored three minutes later to tie the score back up and 5-all. The Nitros scored four more goals by the time the clock read 3:12. Konrad would add her final goal of the game with just 55.6 seconds left on the clock. But the score didn’t matter as much as how far the program has come in just one year on the field.